American newcomer Rainey Forkner has been on Inoubliable Model Army's radar since her riveting Fall/Winter 2012 runway appearance at Cushnie et Ochs. Amidst a line-up of top tier models Forkner convincingly held her own with her piercing, hypnotic green eyes, luxuriant caramel skin tone, and a towering 180 cm runway presence. Modelling for only two years, 20 year old Forkner possesses a fascinating bi-racial mix which challenges industry's perceptions of beauty. Inoubliable Model Army ran into Forkner in Sydney at Chadwick Models Management and spent the best part of an hour chatting with this multi-faceted individual about modelling, dirt bike riding, and her love of literature. Not only is Forkner an amazing beauty, but beneath her initially quiet demeanour lies a bubbly and delightful personality that would charm even the most steely casting director. Currently in Sydney for Australian Fashion Week, Forkner is poised for a crossover to modelling's major league when she returns to New York for the Spring/Summer 2014 season. Inoubliable Model Army: Hi Rainey, thank you for taking the time to chat with Inoubliable Model Army. What brings you to Sydney, Australia? How are you enjoying your time in Sydney and what have been the highlights of your visit so far? RF: I'm in Sydney for Australian Fashion Week and to broaden my client contact. Hopefully in the process, I'll work on some great editorials for Australian publications. I love the city so far, there's so much to do. I would have to say the beaches are the highlight of my visit, they're so amazing and meeting the locals too has been great. Inoubliable Model Army: You're a relatively new face to modelling. Would you mind sharing a bit of your back story? RF: I'm 20 years old and I'm from a place called Ontario in California. I consider myself multi-racial, my father is white of German descent, and my mother is black and Mexican. Inoubliable Model Army: How long have you been modelling for and how were you discovered? RF: I've been modelling for two years now. I was scouted walking home from school in my junior year of high school, and my friend's mother told me to go to an open call at LA Models and they signed me on the spot. Inoubliable Model Army: Rainey is an unusual and unique name! Is there a special meaning or significance behind your name? RF: Rainey is very unusual and I've actually had the privilege of meeting other Raineys as well. There isn't a special meaning behind my name, but the way I got my name is interesting. My dad loves motor sports and he named me after Wayne Rainey, the triple world champion Formula One Grand Prix racer. Inoubliable Model Army: You've already been photographed by Raymond Meier for Teen Vogue and Bruce Weber for Abercrombie & Fitch. Have you grown accustomed to seeing images of yourself in print and is there a particular editorial job or experience that you have cherished so far? RF: I haven't gotten used to seeing myself in print yet! When my Teen Vogue editorial came out all of my friends rushed out and bought copies and wanted me to sign it, which I found kind of embarrassing and overwhelming. The best experience I've had so far was shooting with Bruce Weber for Abercrombie & Fitch. My fondest memory of the A&F shoot was working with all the other models, we had so much fun. It was like summer camp all over again, there were acting coaches and dance teachers on hand to coach us. If I could relive those days, I would in a heartbeat. We shot at Martha's Vineyard, the location was beautiful. At the end of the campaign shoot we were all like a family. Shooting with Bruce was a fascinating experience. I like how he didn't use digital like most photographers do. Bruce had me paired up with male model Shayne Cureton and he asked us to pose in a cute/intimate ya know A&F style. I would strike a pose and he would say "don't move... don't move! That's perfect", and took 10 to 20 captures. Inoubliable Model Army: Inoubliable Model Army recognised you recently at Chadwick's Sydney headquarters and were blown away by your beauty and presence. What do you hope to achieve in your modelling career and which three high fashion designers would you most like to walk for? RF: Most of all I hope to achieve longevity in my career. I would love to walk for Balenciaga, Alexander Wang, and Ralph Lauren! Inoubliable Model Army: You have been gradually building momentum within modelling circles having walked for Cushnie et Ochs, Mark Fast, and Math Collective at the Spring/Summer 2013 collections. What aspects of runway do you most appreciate and how was the experience of appearing in the Cushnie et Ochs show amongst such a stellar cast of established models? RF: I appreciate the clients that book me for their shows and I enjoy going out there, walking the show and knowing I did a good job. It was incredible to walk for Cushnie et Ochs and to be featured amongst such an amazing line-up of established girls. Inoubliable Model Army: The casting process can be a highly competitive and daunting process especially for newcomers. What has been your approach going into castings and what do you feel are the key attributes for wowing casting directors and clients? RF: Strong confidence is key! I try to be more outgoing as normally I can be a little meek and reserved. I focus on making a good impression and also try to just be myself. In fact at the casting for Cushnie et Ochs, I tripped over the hem of the long dress I was wearing and almost fell flat on my face in front of the designer. I think though this helped me to relax and drop my guard which was great because I was cast in the show! Inoubliable Model Army: Diversity in modelling has been a contentious issue in modelling for eons. Do you feel that opportunities for models of colour particularly black models are improving, and how does this affect your psyche knowing that certain markets have a marginally closed door policy based skin tone? RF: It is frustrating that some clients have a narrow view of what is considered beautiful, but I think progress is being made... there are more black and Asian girls around now than years previous. I feel that being bi-racial does affect my chances at times because there are not many light skinned black girls on the runway and whenever I see another mixed girl I do see her as competition from the client's perspective. 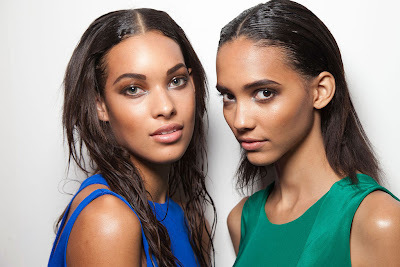 There should definitely be more mixed, bi-racial girls on the runway. Inoubliable Model Army: What do you feel are the greatest challenges that you face as a model and what have been the most valuable life lessons that you have gained as a result of your modelling experiences? RF: The biggest challenges I face would be maintaining my model figure. Hands down the most valuable life lesson I've learnt is that everybody is beautiful no matter what they look like. Inoubliable Model Army: A little birdie whispered that you are a bit of an adrenaline junkie with a keen interest in dirt bike racing! Where did this interest come from and what is it about the activity that you you find most appealing? RF: Well my dad got me into dirt bike racing. He put me on my first dirt bike when I was six and from there it only got better. I now have a Kawasaki KX 100 bike. I love the sense of freedom I have when it's just me and my machine! Inoubliable Model Army: What are your other key interests outside of modelling? RF: I love to write and am an artistic thinker. My mom is a language teacher so she would encourage me to read Shakespeare and to compete in writing competitions when I was in school. Inoubliable Model Army: In an industry where models are often subjected to physical scrutiny and assessment, how do you manage to maintain a clear identity and sense of self? RF: I realise I get judged based on my appearance but don't let it get to me. I let it roll off my shoulders like rain. It hasn't been difficult for me to stay true to myself as my parents instilled in me the values of humility and besides I've never been an egotistical person. Inoubliable Model Army: What makes you "Inoubliable" (Unforgettable)? RF: I'm shy but once I open up... OMG! I'm a very lively person, I love people who live life to the full. I speak whatever is on my mind, I'm spontaneous, outgoing, goofy to the max! I'm always smiling and I know almost every song by heart!